Should I buy my tickets in advance? 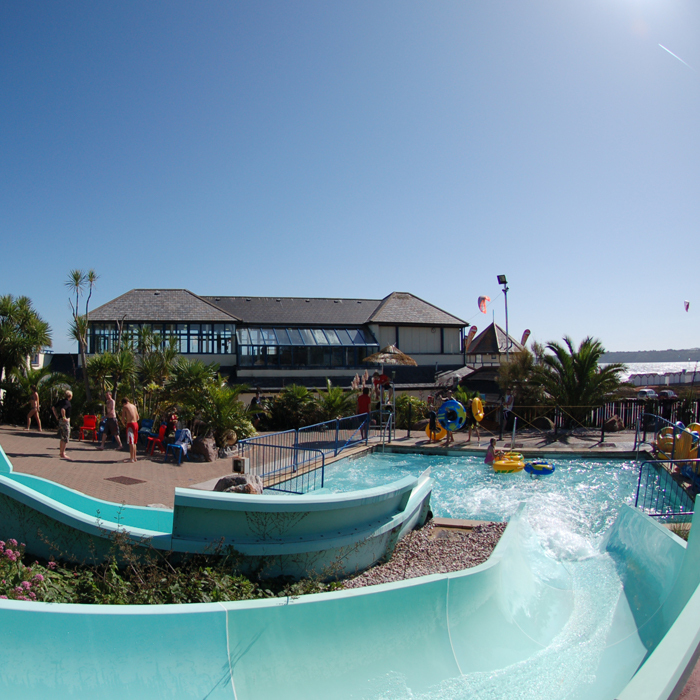 We highly recommend booking online in advance, as this guarantees a quicker entry to the waterpark. We have a fantastic online booking system which allows you to easily book your visit in advance and beat the queue! However, you can also just turn up on the day and pay at reception, but, in Peak Season please be prepared to wait, especially if it is sunny. During the holidays the busiest hours are between 11am - 3.30pm and it can get extremely busy, especially so on sunny days. The waterpark is much quieter as we open and after 3pm. We now offer a variety of Peak Season ticket options and we would higly recommend purchasing an Early Bird or Sunset Splash Ticket if you are visiting with younger children. What age can the children go into the water by themselves? The minimum age that a child can go into the water unaccompanied is 9 years old. You should be aware that it is possible to exit our facilities and get straight onto the beach; you must satisfy yourselves that your children are old enough to be responsible and understand where they should be. We cannot take any responsibility for unsupervised young people. Tickets purchased online are non refundable as they are taken from an allocation which has a maximum and their purchase will prevent them from being purchased and used by other visiting customers. At the management's discretion, with a minimum of 24 hours notice, emailed requests to alter the date and time of the visit will be considered. Yes, if a valid NUS card is shown on arrival, students will recieve £1.20 OFF standard off-Peak 2 hour admissions or peak Early Bird & Sunset Splash admissions. If you book online you must bring your NUS card with you. You will have to pay the difference in entry price to enter if you cannot produce it. Do you offer any discounts on standard admissions? Yes, babes-in-arms are FREE and both children under the age of 5 and adults aged over the age of 65 will receive discounts off of standard admissions. We also offer a 50p 'family' discount per person on any standard admissions when purchased as a single order consisting between 4 & 9 tickets. Can I just come in and watch? After taking onboard customer feedback we now have a 'spectator' admission. A small allocation of these admissions are avaliable for those who don't wish to go in the water. These admissions can only be purchased online and are charged at £15.50. 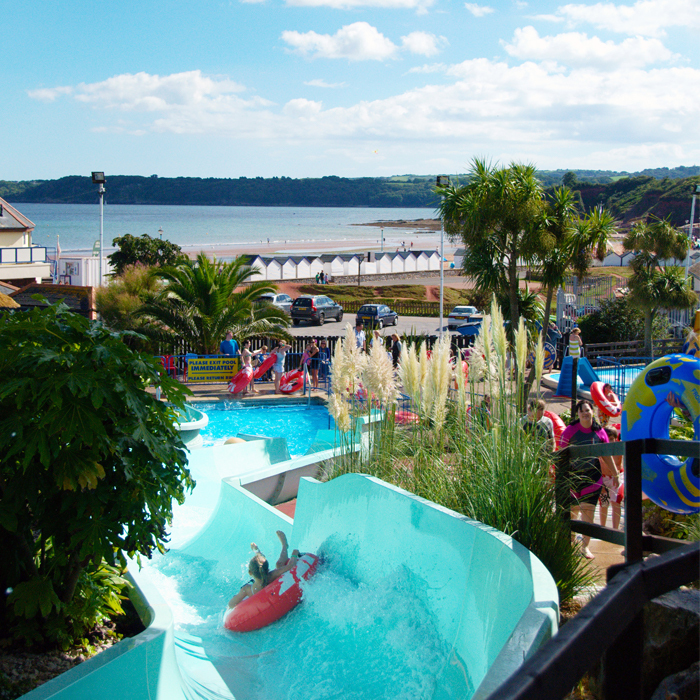 We will refund £10 on departure if the ticket-holder has not been in the water. Ts & Cs Anyone found to be abusing this admission will be asked to leave the park immediately with their whole party. In this instance we reserve the right not to issue refunds to any member of the group. Standard admissions can't be booked via the phone, only on our website www.splashdowntickets.com or on the door. Group visits can be pre booked either by phone or online. Is there anything for younger children to do apart from the slides? At Splashdown Quaywest we offer a great selection of facilities suitable for our younger visitors, under confident or novice swimmers to enjoy. Little landlubbers aged 6 and under can splash about in both our Submarine Adventure and Blennies Tiddler Pool. We recommend that families with small children visit at the quieter periods of the day during school holidays i.e. first thing in the morning or later on towards the end of the day, or during off-peak seasons – this will ensure your maximum enjoyment. For more information please see our VISITING WITH UNDER 7s page. Can we use our own tyres? Yes, you may bring your own tyres into the waterpark if they are handled and are 38 inches or bigger. However, please only use tyres on rides marked as a tyre ride and not in the pools. We have a unisex changing village with individual private cubicles. We also have a selection of larger changing cubicles, perfect for families with younger children. Some have baby changing stations. Yes, there are lockers in our changing rooms. These require a 20p coin. The lockers are non-refundable. Yes, we do have swimming pool area at Splashdown Quaywest. No, we do not permit picnicking at Splashdown Quaywest but we do offer a wide variety of food and drink options onsite. All food and drink consumed at Splashdown must be purchased on the premises. You will be asked to put your own food and drink away. Can I use my camera in the waterpark? No, the use of any equipment capable of recording still or moving images is strictly prohibited without prior permission of Centre Management. No, the use of cigarettes and e-cigarettes is strictly prohibited on the premises. How tall do I need to be to use the rides? Visitors must be at least 1m tall to ride the flumes. Do your slides have a weight limit? No, but we do offer advice on the slides based on the individuals BMI. If an individuals BMI exceeds 30 we recommend that they talk to one of our duty managers before purchasing tickets to the waterpark. A BMI of 30 or more may make the individual more susceptible to injury and compromise the rescue procedures outlined in our emergency action plan. Mesasure your BMI using the NHS Healthy Weights calculator. If I am pregnant or have health problems can I ride the flumes? Our rides are not suitable for visitors who are pregnant, recovering from recent surgery, injury or suffer from heart, back or neck problems. Visitors who have recently suffered from sickness and diarrhoea symptoms should wait 48 hours since their last episode before visiting the waterpark. 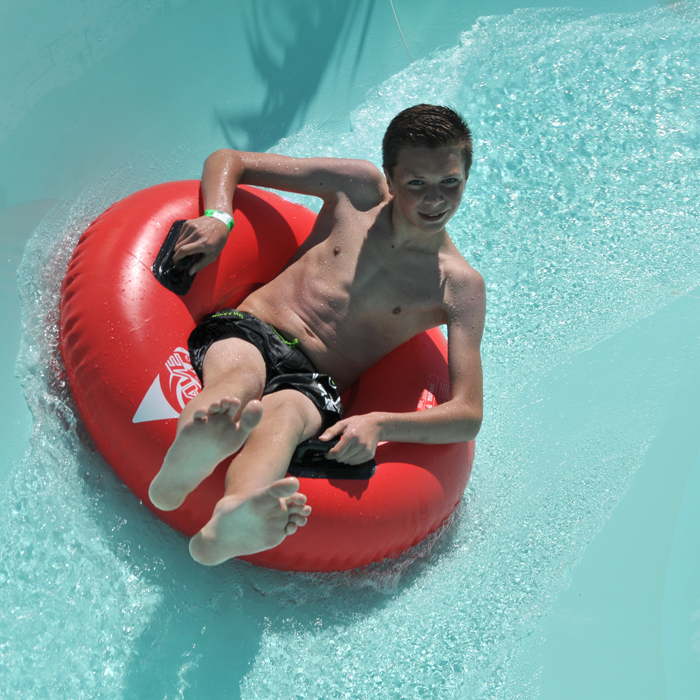 Ideally yes, we strongly recommend that visitors using the rides have an adequate swimming ability but you can still have fun and be safe if you feel that you are confident in the water. 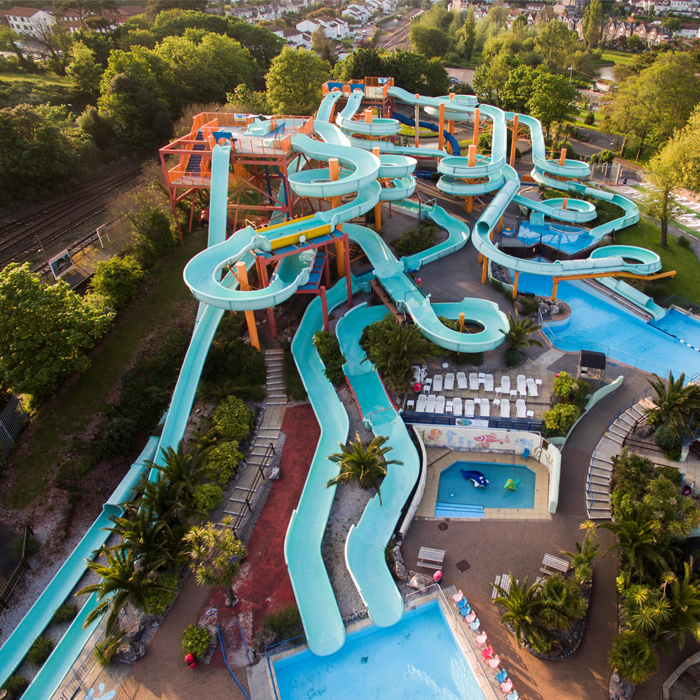 We have a variety of flumes with water depths ranging from 0.5m - 1.2m and advise you make sure that you check the water depth at exit of any other slide before you ride. We strongly recommend that weak swimmers do not use our flume rides. However, only you can decide how confident you are in your swimming ability in relation to the slide information provided, if in any doubt please speak to a member of the team. Can younger children wear armbands? Yes, if a child is not confident in the water then armbands are the best option. Please be advised armbands can't be worn on three of our rides at Splashdown Quaywest. Can I wear glasses and jewellery? No, both must be removed before entering the waterpark. Spectacles pose a safety risk to both you and other swimmers and loose fitted piercings could also pose a risk to your own safety. We recommend that you leave jewellery at home. What about goggles and t-shirts? Goggles may be worn at the management's discretion if a disclaimer form is signed on arrival. T-shirts can be worn on the flumes. Yes, although the water is heated, sometimes it can be nippy on the top of the towers. You can wear your own wetsuit in the waterpark - or hire one of ours for the day. We offer FREE westuit hire (refundable deposits apply). Just make sure you tuck in the tag at the back! What is viewed as unacceptable swimwear? Cut off jeans and trousers, baggy shorts beyond knee length and transparent/inappropriate costumes are not permitted. We politely ask that visitors do not wear swimwear with zips or buttons as these may damage the flumes. If you have specific dress requirements for religious reasons - speak to a Duty Manager. Any alternative attire must be appropriate for a water environment. Please be advised white and luminous coloured swimwear does have a tendency to go transparent, management will ask those they feel to be dressed inappropriately to get changed. We also cannot guarantee the fastness of the colour of your swimwear, although we use normal pool chemicals it may affect the colour. Can I buy swimwear onsite? How do I get to Splashdown Quaywest? We are located Brixham bound just off the Dartmouth Road (A379), displayed on brown attraction signposts marked Quaywest. Sat-navs should use the postcode TQ4 6LN. Not travelling by car? Check out our Find Us section. Yes, unfortunately we are unable to offer onsite parking. However, there are large pay and display car parks adjacent to the waterpark.